The Wonderland Lake park in the Wonderland Hill Neigbhorhood of North Boulder.- courtesy City of Boulder Parks and Recreation. North Boulder, or NoBo as has been coined, is an up-and-coming area of Boulder proper filled with opportunity and modern charms. Although difficult to encompass this area in merely one post, allow this overview to delight the senses and splash light on just a glimpse of all that this area offers. The highlights of NoBo include, but are certainly not limited to, the unique neighborhood variety, the local schools, and the social life. All of this, of course, is situated within the wider context of mountainside living and open spaces for any and all nature-related activities. The neighborhoods of NoBo are among its most well known features. From the urban and ultra pedestrian-friendly Holiday neighborhood to the fashionable appeal and great mountain views of the Newlands neighborhood, this area has diverse housing options to suit everyone’s tastes. The Holiday neighborhood’s aim to fuse affordability with ingenuity is evident in the mix of community and business life sprinkled throughout their 333 one-of-a-kind housing units. A similar NoBo area, known as Uptown Broadway, has also been an instant hit with buyers and renters alike as it combines convenience with community. The Wonderland Hill neighborhood sits in a spectular setting nestled up agains the north Boulder foothills, surrounded by open space, hiking/biking trails, and the popular Wonderland Park, and Wonderland Lake. This Boulder neighborhood is one of the most sought after destination for those looking the balance the convenient access to downtown Boulder with the serene setting of Boulder’s natural environment. Wonderland Hill truly is a Wonderful place to live! Beyond the great living space, NoBo offers quality education through their numerous elementary, middle, and high schools- both public and private- in the area. For example, Centennial Middle School scored well above the state average on the Math, Reading, and Writing subjects in the 2012 Colorado Student Assessment Program. Another, Crest View Elementary School, has been celebrated for its diverse student population and caring teaching staff. The Tara Performing Arts High School offers students a chance to explore learning through the creative arts and is famed for truly bringing education to life. Others, like the Shining Mountain Waldorf School and the Jarrow Montessori private schools, receieved raving reviews from both parents and students alike for their academic achievements and dedicated faculty. For recreation and social life, NoBo is indeed a vibrant spot to be. With the Foothills Community Park, North Boulder Park, and the North Boulder Recreation Center, there is no shortage of activities sure to get your heart pumping. Fine dining is also readily available. In fact, some of the most celebrated restaurants and specialty groceries stores are clustered in northern Boulder. Places like Restaurant 4580 (currently closed, but set to reopen this Spring), Ideal Market, Lucky’s Café, and Arugula Bar e Ristorante are just a small sampling of the cuisine offerings available to residents and visitors alike. Of course, NoBo’s close proximity to downtown Boulders also means that a RTD bus ride can quickly get you over to Pearl Street and beyond. 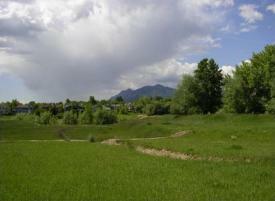 All in all, North Boulder is a place of expansion, excitement, and opportunity. From housing to the latest happenings, NoBo has it all. If you are interested in learning more about properties for sale in this area, contact our amazing team of real estate agents for the best information. For rental inquiries, our rental specialists are ready and happy to assist you! This entry was posted in Boulder and tagged Boulder, dakota ridge, Holiday Neighborhood Boulder, Ideal Market, Jarrow Montessori School, Luckys Cafe, Newlands Boulder, nobo, north boulder, North Boulder Apartments, North Boulder Homes, North Boulder Rentals, Shining Mountain Waldorf School, Tara Performing Arts High School, uptown broadway apartments, Wonderland Hill Boulder on March 11, 2013 by Stephanie Iannone.